Both Destiny 2 and its predecessor have had some oh-so-exploitable glitches over the years, but Bungie may have just patched out one of the worst/best yet. Players had figured out a way to glitch through The Whispering City and open a chest from the upcoming Last Wish raid, which would be a big enough deal on its own - but then over the weekend it surfaced that there was also a relatively easy way to open that chest as many times as you want. First, players had to follow a complex series of terrain glitches and difficult jumps to get to the chest itself; normally you're only supposed to get to that part of the world in the course of running through Last Wish. This video will show you the roughly five-minute process, but do note that Bungie has now "suppressed" the chest ahead of the raid going live, so it will no longer be a productive run. More power to you if you just want to go for a strange journey behind the walls of The Whispering City, though. That would get you a single piece of loot from the new Last Wish set of items, which was cool but not really game breaking. Then somebody discovered that if you made a new character and completed Destiny 2's first mission, you could open the chest again! And again and again and again! 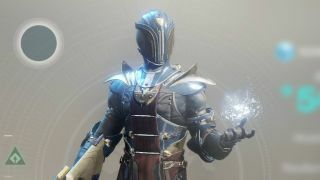 That's the story behind this image making the rounds of a Warlock with the full, new armor set. To recap, that Warlock now has all of their class' Raid armor, days before the Raid even goes live. You can see why Bungie would want to nix that as soon as possible. According to a post on the official forums, the chest itself will no longer yield any loot until Bungie can restrict it to the actual Raid activity. However nobody's exploit-gotten gains will be removed from their inventories. It still took some appreciable effort - all that glitchy platforming and alt grinding - and didn't hurt anybody else, so I'm glad tricksy Guardians aren't being left with nothing to show for it. Prepare for more strangeness with this Destiny 2: Forsaken Paul McCartney Easter egg.